There’s a lot that is interesting about The Long Game, probably more than is ultimately successful. But that’s easy to forgive. After all, the first season of any show is about laying down the ground-rules and trying to figure out what works and what doesn’t. 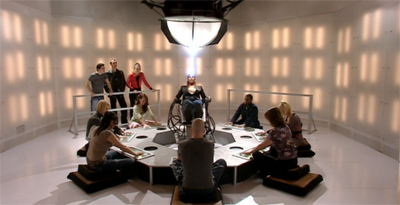 The Long Game is the show’s second big “futuristic” episode, following on from Davies’ The End of the World. However, The End of the World was really a paper-thin murder mystery with science-fiction trappings that served (in effect, if not in name) as the second part of Rose. The Long Game is a much more traditional Doctor Who science-fiction story. That makes sense, given that Davies is really just reworking an idea that he originally pitched to the show in the late eighties. Andrew Cartmel reportedly asked him to focus on a more mundane and grounded story instead, which seems to indicate that Davies’ more grounded first season is really a direct successor to Cartmel’s approach to the show, just extrapolated and enhanced through the wilderness years. And yet, despite the fact that this is an old script, Davies takes great pains to remind the viewer that this isn’t the classic show. The Long Game follows directly on from Dalek. The presence of Adam among the TARDIS crew is a rather obvious nod towards modern storytelling conventions. Much as Aliens of London demonstrated that the notion of Rose and the Doctor just absconding into all of time and space couldn’t be sustained in the television of 2005, Adam’s presence is another indicator of how times have changed. Doctor Who can’t be what it was. You can’t have the same unchanging status quo that used to exist, with the same Doctor and companion team staffing the show for years at a time. Similarly, you can’t really push the whole “no hanky panky in the TARDIS” rule, because that’s not how television works. Sexual tension between characters is a staple ingredient of television diets, so it will inevitably be a part of Doctor Who. Eccleston’s Doctor is perhaps the most human version of the character, with the possible exception of Davison’s portrayal of the Time Lord. He’s hurt and wounded and bitter, but he’s also humanised in a way that no other version of the character had been before him. It’s not just acknowledging that the Doctor can have a sexuality, because The TV Movie – as Steven Moffat pointed out – introduced the concept of the Doctor as a romantic lead. Rather, Eccleston’s Doctor seems to be the first Doctor who has to deal with people on a rather personal level, rather than as an outsider looking in. He has to navigate the personal relationships that exist around him. There’s a lovely introductory gag where the Ninth Doctor introduces Rose to “the Fourth Great and Bountiful Human Empire.” He gives her a quick prep talk, and then allows her to make the introduction to Adam. Although he jokes about the pair of them as a couple (urging them to enjoy their “first date”), he’s keenly aware that there is some hint of chemistry there. Given how oblivious the Fifth Doctor (and the show) was to the weird pseudo-sexual chemistry that existed between Nyssa and Adric on that TARDIS (come into my bedroom with your giant cable! ), it’s an obvious indication that the Doctor is getting better at these things; and that the show is going to have to deal with them. Indeed, the first season seems to suggest that the strength of the Doctor is as a figure who inspires others to action; that his gift is the ability to navigate human relationships and help people to help themselves. This was obviously an element of the classic show, and remained a part of the series after Eccleston left, but it feels much stronger in the first season. The Long Game is perhaps the most obvious example, with the Doctor standing on the side-lines urging Cathica to action, but it’s also part of The Parting of the Ways, where the Doctor inspires Rose Tyler to save the universe. To be fair, it’s easy to see why Davies and the show moved away from the “Doctor inspires supporting character to be the real hero” motif. It doesn’t make for exciting television, watching the character wander around and convince random people to save the day with the power of his words. It involves the intermediate step of convincing the audience to care about the strange new world of the week and the people in it, which is a lot tougher than convincing viewers to invest in a consistent leading character. It also serves to undermine the lead character, by making him appear somewhat marginalised in his own show, which is very much the case with quite a few of the episodes centred around the Ninth Doctor. Gwen has to make the big heroic decision in The Unquiet Dead and save the day, after the Doctor miscalculates; the Doctor lacks the heart to put the logical conclusion into effect in Father’s Day; The Doctor Dances hinges on an admission made by a guest star. 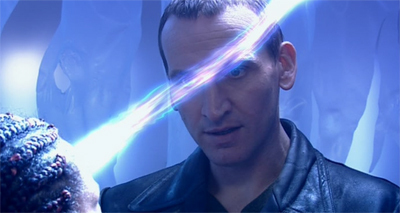 Still, this reliance on inspiration rather than direct action is something that remains relatively unique to the Ninth Doctor, perhaps making him the perfect expression of the “man who makes people better” philosophy espoused by the Master in The Sound of Drums. While it wouldn’t necessarily have worked in the long term, and perhaps explains why the Doctor feels almost out-of-focus in this first season, it is an interesting and clever approach. It demonstrates how much the Doctor, and Doctor Who, rely on people. There’s a decidedly “soap opera” aesthetic to Davies’ approach to Doctor Who, and he brings that on to the TARDIS in the form of Bruno Langly, who is best known for his work on Coronation Street. Indeed, Davies seems to consciously poaching from soap operas – part of the subtext of getting Kylie on Voyage of the Damned is her work on Neighbours. In the same year, the second season of Torchwood managed to recruit Alan Dale, another Neighbours alumni who would probably still be better known to viewers for his work on that soap opera than the large volume of his genre work on American television. While Davies is making a very clear point by devoting so much time to Adam, he creates the first significant problem with The Long Game. There is simply far too much going on here, and not enough room to reconcile it all. Adam’s subplot involves the character wandering away from the TARDIS and being completely divorced from the plot until the climax. “You know, it’s not actually my fault, because you were in charge,” Adam argues, trying to deflect blame, but he has a bit of a point. He doesn’t seem like a member of the TARDIS crew, he’s just a bloke who arrived on the station the same way that they did. Still, Adam is an interesting character, if only because he’s so very shallow. He exists to get kicked off the TARDIS. His sole function is to assure viewers that there must be something inherently special about Rose, and that not just anybody can travel with the Doctor. The episode accomplishes this in the most blunt manner possible. Adam tries to use time travel for personal financial gain, and the Doctor kicks him off the TARDIS for it. “I only travel with the best,” he explains, rather bluntly. There are several problems with this. For one thing, Adam feels incredibly under-developed. He’s more a plot function in the series’ over-arching plot than a character in his own right. 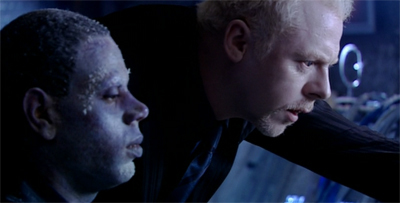 In the audio commentary for the episode, director Brian Grant talks about how early drafts of the script gave the character motivation and depth – he was trying to find a cure to help his sick father. This was trimmed from the episode, however, leaving us with the generic and simplistic “greedy capitalist” archetype. Given that the Doctor is about enabling and empowering people, and encouraging them to be all that they can be, the punishment feels almost malicious. His punishment is that Adam could never be exceptional in any way, shape or form. He probably can’t even go out in public. While kicking him out of the TARDIS for trying the change history is perfectly fair, leaving him in that state feel a little bit mean. Of course, the treatment of Adam here feels especially vindictive in light of Father’s Day. In the very next episode, Rose herself changes history. Sure, she doesn’t do it for monetary gain, but her scheme is far more manipulative than Adam’s simple opportunism. 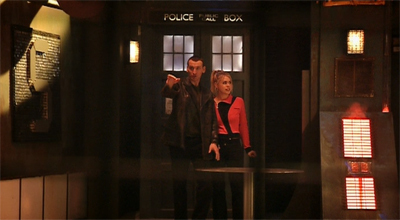 As the Doctor points out, she came with him when he said “time machine”, and she asks to revisit the scene of her father’s accident specifically so she can alter history. Given that Adam’s plan didn’t lead to the destruction of time itself, and given it was purely opportunistic, the Doctor’s willingness to completely forgive Rose feels a little simplistic. We’re beginning to stray into the series’ familiar “Rose is special because she’s Rose” philosophy, with the narrative of Doctor Who conspiring to give the character absolutely anything she could ever want, because she’s just so awesome. Still, this is just one half of The Long Game, and it’s the half of the episode that is very clearly looking forwards – defining what Doctor Who needs to be in order to survive in the television landscape of 2005. It needs character arcs and long-form storytelling, and big themes resonating and playing out across the season. However, the other half of The Long Game is very clearly looking backwards – connecting to the show’s roots. The Long Game followed on from Dalek, which was obviously a major point of intersection between the classic show and the revival. Not only did it reintroduce the Doctor’s iconic pepper pot villains, it also featured the detached head of a Cyberman. These are iconic elements of Doctor Who, and aspects of its past that have managed to seep into popular consciousness. It’s easy to bring back the pieces of Doctor Who that everybody loves and recognises. After all, even The TV Movie featured a shout-out to the Daleks and the reappearance of the Master, while still having difficulty understanding what Doctor Who is. It is much more challenging, then, to bring back the parts that people had difficulty with, the more complex aspects of Doctor Who. The Long Game represents a conscious effort to reconnect with the classic series in a way that is just as important as bringing back the Daleks and the Cybermen and the Master. In this case, it’s confirming that “Doctor Who” doesn’t just mean “the Hinchcliffe and Holmes stuff” or “the Barry Letts era.” It must include the less popular eighties stuff. The Long Game effectively confirms that Davies’ vision of Doctor Who is a spiritual successor to the version that was edited by Andrew Cartmel. Of course it’s not true, just a comforting lie to keep people in line. The snapshots of life on the station present a corrupt and decayed society. When Adam visits the medical bay to consider a procedure, the nurse assures him, “You’ll have to pay for it. They’ve stopped subsidising.” An announcement tells us, “All staff are reminded that the sixteen forty break session has been shortened by ten minutes. Thank you.” The working conditions are abyssmal, always too hot. 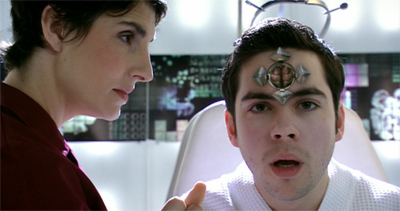 People are even used as processing power on Satellite 5, just “human resources.” When Rose and the Doctor witness Cathica plugging herself into the feed, the Doctor explains how her brain has become part of the machinery. “Compressed information, streaming into her. Reports from every city, every country, every planet, and they all get packaged inside her head. She becomes part of the software. Her brain is the computer.” Of course, she doesn’t get anything out of it. “She wouldn’t remember any of it. There’s too much. Her head’d blow up. The brain’s the processor. As soon as it closes, she forgets.” She’s just used. This brings us to the second major problem with The Long Game. It’s very clearly a script that was intended for the classic series. It has a rake of big and clever ideas, but it relies on world-building that can’t easily be crammed into forty-five minutes alongside plot and character development. The station would seem more nuanced and sophisticated if we spent a bit more time there, but we never get enough of a view to really see this society as anything beyond a one-dimensional capitalist dystopia. To be fair, this is the first season. There is a learning curve, and Davies learns quickly. The show would go on to visit several futuristic settings and alien species repeatedly, allowing for world-building and development to be more evenly spread across several episodes. 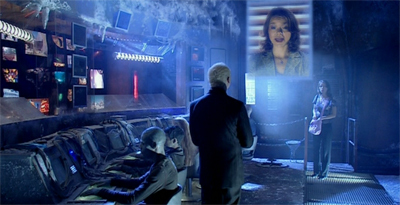 The repeated visits to “New Earth” help to build a sense of a society, and Planet of the Ood plays well off The Impossible Planet and The Satan Pit. It even happens in the first season. 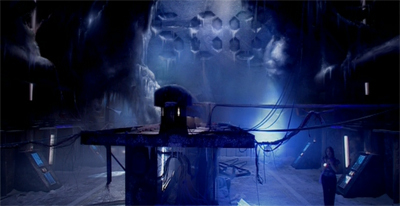 The use of this same futuristic Earth for Bad Wolf allows the viewers to be brought up to speed a lot quicker, and allows Davies to establish what he needs to establish efficiently. Still, while The Long Game has difficulty building an entire world in only forty-five minutes, it’s clear that Davies is trying very hard. There are moments when The Long Game is a bit too “on-the-nose”, with a sense that Davies is hammering the same points a little too hard. On the other hand, it’s hard to hate a story about an evil future where the Daleks have installed an alien Rupert Murdoch to help keep us humans in line; only to fall back on reality television when that doesn’t work. It’s a very pointed a clever piece of social commentary about how what we hear and repeat shapes the way we look at the world over time. As the Editor himself explains, “Create a climate of fear and it’s easy to keep the borders closed. It’s just a matter of emphasis. The right word in the right broadcast repeated often enough can destabilise an economy, invent an enemy, change a vote.” This is properly and boldly political Doctor Who, and it’s just as exciting as Daleks or Cybermen. It helps that The Long Game has aged quite well in the years since it was originally broadcast. The Editor, as played by Simon Pegg, seems like a perfectly topical villain. He isn’t a megalomaniac or a zealot. He’s a middle-man, an enabler. When Rose points out that he’s human, he replies, “Yeah, well, simply being human doesn’t pay very well.” Apparently he’s the banal form of evil that stands in for “a consortium of banks.” These banks are, as Bad Wolf reveals, controlled by the Daleks. Had The Long Game been written a few years later, it would have seemed a little heavy-handed. Instead, it seems deliciously prescient. The Long Game isn’t the strongest episode of the first season of the revived Doctor Who. However, it is the episode the makes the clearest connection to the tone and form of the past, if not necessarily the content. It’s an episode that is very much about reconciling the history of Doctor Who with the demands of its current format, and proving that the show can still be politically and socially relevant. It doesn’t do all this flawlessly. It’s quite clumsy in places, stumbling under the weight heaped up it. At the same time, it’s hard to hate the ambition of the episode.